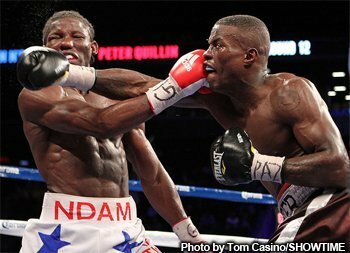 Exclusive Interview by Geoffrey Ciani – I was recently afforded the opportunity to speak with the new WBO middleweight world champion Peter ‘Kid Chocolate’ Quillin (28-0, 20 KOs) following his title-winning victory against Hassan N’Dam N’Jikam (27-1, 17 KOs) last Saturday night at the Barclays Center in Brooklyn, New York. Quillin spoke about his performance, talked about his future, and gave his views on the current middleweight landscape and where he would like to go next. Here is a complete transcript from that interview. GEOFFREY CIANI: Hello boxing fans. This is Geoff Ciani from East Side Boxing, and I am joined here today by the newly crowned WBO middleweight champion of the world, Peter “Kid Chocolate” Quillin. Pete, how does it feel to win your first world championship? PETER QUILLIN: It feels great. It feels good to come a long way to have some kind of achievement to what my hard work has given me. But most importantly I got to know that there’s going to be some more fights in the future that’s going to allow me to show what my class is really about. CIANI: Now Pete, during the fight, it appeared to me during the first three rounds that you had a little trouble with his rhythm and that you weren’t able to time him maybe as well as you would have liked to. Reflecting back, what was going through your mind during those first three rounds? QUILLIN: Well it’s a fight! You know I have to take what the fighter is going to give me after sitting down and being able to see things. He’s pretty fast. There were some things I had to learn about him, and if I had never learned about him then he would have won. But I learned about him, and I caught him some time in the fight where I told the media before that when I hit him he’s going to have to really evaluate himself as a fighter and see what he really is. That’s what made the fight what it is, and I can’t take anything away from him. Knowing the performance that I put in, I know that with every performance I got to take from it and get better from it. CIANI: Now in the fourth round you got a couple of knockdowns there, scoring them with your left hook. What were you thinking at that point during the fight and what enabled you to land such clean flush shots at that point? QUILLIN: Being an accurate puncher and being able to learn about guys when I’m in the ring with them, and training and preparation towards this fight was really good. So you know, I just learned a lot about myself in that fight, and I’m gracious to be able to grace the ring with a guy on the inside who came to really win. CIANI: After the round where you first scored your first two knockdowns, I know a lot of fans were a little surprised that you didn’t go all out for the attack. What was going through your mind in round five after you had him seemingly badly hurt the previous round? QUILLIN: Well you only can do what you can do. When you’re in the moment in boxing you got to be able to evaluate those moments and see what you can do. If you hurt somebody and you hit somebody, it’s more than likely they can hit and hurt again in my opinion. Maybe that’s just an opinion, but for me I said it before. I said that when he gets hit so many times in the fight, he’s going to have to determine what type of fighter he was. To me I give him a label as a champion, because he got up every time when a lot of guys wouldn’t have been able to get up after taking some of them shots. CIANI: Now the next round, the sixth round, you scored another pair of knockdowns. Did you think at this point that he was going to be able to last twelve rounds with you? QUILLIN: As I’ve said and I told myself that I’m ready for twelve rounds, and I can’t take away from a guy that can say he’s ready for fifteen. So I can only guess that he in his mind can say that he can go twelve and do all the things he did in the fight. Only he’s allowed himself to be able to feel that way, but I was prepared for twelve rounds, and that’s what we went, and I’m very fortunate to be able to do twelve rounds and put on a performance that I did. CIANI: In rounds eight through ten, they were fairly close rounds. N’dam seemed to be fighting back his way into the fight a little bit. What was going through your head then? Did you think that you were up on the scorecards when you were entering the final round, for instance? QUILLIN: Well I just knew I was in a fight and I couldn’t look at what I thought I won, because when you look outside of a fight from actually being in it, it’s a different view. If I ever tell you that I always think I’m losing, I always feel that way. I feel like I’m losing so I have to find ways to win and do whatever it takes. But a fight is a 50-50 fight to me. When you’re fighting a guy it’s a 50-50 because one punch can change the fight. This wasn’t a fight that everybody thought I was going to win, even though the odds were two-to-one or whatever. But it’s 50-50 once you step in the ring and you look across the ring and you see a guy looking at you. It wasn’t like a fight that I was thinking I was going to outclass him. It was just I had to work towards these things in the fight, and I’m very glad that I had a great camp with my brother, and my best friend Johnny in the camp, and my best friend who pushed me to the limits. But I look at it at the end of the fight where I can maybe go back and say what rounds I lost. CIANI: So did you have any doubts when the final scorecards were read that you were going to have captured your first world championship? QUILLIN: No doubts, because I knew N’dam didn’t have enough time be able to take the lead. So like I said, I’m just blessed man and I’m thankful, and I hope I keep inspiring people, and I continue to work hard like I do to be able to be the champion that the fans want me to be. CIANI: Pete, a lot of fans are talking and a lot of fans are wondering. What’s next for you? And I know that you just won your championship and you’re going to take some time probably to celebrate that. But what’s next for you and when do you think we might be able to expect you back in action? QUILLIN: I don’t think I’m going to be able to relax and not think about boxing until I’m retired from boxing. As long as I’m participating, everyday is like me looking and thinking about when my next fight is going to be, who I’m fighting, and how I got to prepare, and how to put things in order, how to make the camp better. Like those are the things I tell myself all of the time. It’s just like I’m thankful for that type of mentality to be able to think like that, because a lot of guys are like I don’t deserve a vacation. I don’t even deserve water. I don’t deserve food. So this is only just a step towards where I want to be, and I’m just like I said, thankful. CIANI: When you look at the middleweight landscape right now, the names that people are talking about besides your own: Sergio Martinez, Gennady Golovkin, Daniel Geale. What do you think of those guys? QUILLIN: All of them are stellar names, and all are good opportunities, and all are good fighters. Any of us fighting each other or fighting one another, it’s a good thing to have so many stellar names in the division to be able to have knowing that there are names out there and great fights to be put on. Hopefully you see me in one of those fights very soon. CIANI: Would you have a preference if you could write your own book here on whom you’d like to fight next? QUILLIN: I would like to fight Sergio Martinez if offered the opportunity, because it seems Sergio Martinez is who they are eyeing because of the name. That’s who I would say, and me calling him out for so many years and saying I would love a fight with him. But you know the most important thing I can say is I trust the team that I’m working with. Al Haymon as my advisor, and then my management John Seip and Jimmy McDevitt and Golden Boy, I think they’re going to work on a great kind of opportunity for the state of boxing, the whole sport of boxing, to be able to put on a performance that they would love to see. I think that’s most important, but also to make sure that all of these years of hard work that I put into it, that I’m able to see some revenue from it and keep continuing to live my life, and just be blessed and pass the blessings on to those people I’m with. CIANI: Pete, a lot of guys in the boxing message boards that I’ve been reading, they’ve been talking about sparring sessions that you had in the past with Golovkin, and I’m wondering if you could tell the fans out there what, if anything, were you able to learn from your experiences sparring with him? QUILLIN: I’ve always said about every kind of sparring that I learned I can be on their level or beyond their level. So you know with Gennady Golovkin I can say he’s a very strong fighter, very determined, but he doesn’t put any fear in my heart at all. So with that being said, it’s like he’s supposed to be looking the way he looks after having over 400 amateur fights, and he should be thankful for where he’s at, and he should be one of the best. It’s just how I feel. I feel like that to a point where I’m at right now to be able to say I got an “X” on my back where everybody is trying to run towards. I got an “X” in front of me. I never said I was Superman, but I just know one thing. I set myself and all of the hard times in my life are paying off right now. I’m just thankful, so I will be prepared for anybody they put me in the ring with, because I think holding this title I have to be responsible with it, but not even that, I have to work even harder. CIANI: You’re a world middleweight champion right now. You’ve had some experience at 168 during your career. In the immediate future, for the next couple of years, the foreseeable future, do you see yourself staying at 160 for awhile? Or if the right opportunities come up, might you venture north to take on some of the top names in the talented rich 168 pound division? QUILLIN: Well right now if you look at it, Bernard Hopkins went down in history as being one of the guys that held the title for over 20 defenses. I just got the belt right now, so it’s probably best that I try to shoot for that kind of goal, to be able to make defenses of my belt, to being able to break records and think about things that can help me by saying I have achievements when it comes to boxing. So maybe I’m looking beyond the line, but I set my goal as being a world champion. Now I have to reset my goals as being a world champion now and towards where I want to be at five/ten years from now. I’m going to have to really seriously think down to myself what that might be, but right now I’m campaigning at 160 pounds. There are no problems to make the weight. I got a very solid team working with me with my conditioning. I got Robert Garcia who I just brought on as a part of my team to help me with nutrition and to make sure I get all the right kind of natural supplements that my body needs. You know I’m just shooting for the stars and go beyond a star. CIANI: In your opinion are you peaking right now, or have we yet to see the best of Peter ‘Kid Chocolate’ Quillin? QUILLIN: Well that’s yet to be seen. I just became a world title holder, and like I said I got to reset my goals. But I’m always working to make my goals and dreams come true. To be able to go out there and perform and look good, that’s all I really want to do just because that’s what got me here. Like I said, the only thing I have to make different in my life is just the work ethic that I’m willing to put into it. So with that said, yeah! You should be only seeing some of me, but you’re still yet to see more greatness to come. CIANI: Now that you’ve become a middleweight champion, the next morning when you woke up, how long did it take to sink in for you that, after the journey you’ve undergone, you finally achieved one of the big pieces of your goal. You talked about that last time we spoke. How did that just feel for you? QUILLIN: Well to see where I came from to where I’m going, the journey is not complete. It’s still got yet more to be done. I look back at what I’ve been through and I don’t dwell on it, because I believe that whatever failures in the past that I had is only going to help my future to become a better person, a better champion, you know hopefully I have kids one day and become a better father, a better brother to my brothers, better to my family, and to better in all aspects, and that’s what I’m very fortunate and blessed to say that I’m able to do. And that’s what I’m working towards. CIANI: What was the whole experience like for you to be able to win that world title there in Brooklyn? QUILLIN: Oh man! It’s historic. It’s carrying on a name that has legendary status to it, and also being able to add just all around having myself there. Thank God. Thank you for all the things you’ve done for me, but I want to get more out of this sport and be able to just keep going, man; just keep striving to be the best. CIANI: Pete, I have one final question for you, and that is, is there anything else you would like to say to all the boxing fans out there, all of your supporters, and all of the readers of East Side Boxing? QUILLIN: First of all I want to thank you for giving me the time. I want to thank the whole site for giving me the love, and the respect, and the support. I want to thank the fans for tuning in and watching the fight and having positive things to say about it, whether it’s positive or whether it’s negative, I’ll take from it and just become more motivated. Hopefully I can keep going out there and giving you the blessing that I’ve received from God to be able to be a winner, and keep on winning and inspiring people through hard work. CIANI: Pete, it’s been an absolute pleasure as always getting the opportunity to speak with you here today. I want to congratulate you for winning your first championship belt, and I think I can speak for all boxing fans out there when I say I’m looking forward to see what you do next. QUILLIN: Alright, you should see that coming soon. Thank ya’ll! Make sure ya’ll follow me on Instagram @kidchocolate and the same name on Twitter, and if you don’t get those, you can go to www.thekidchocolate.com and I have links to all my social networks, my Facebook fan page, and go stop at the Swag Store and buy a couple of shirts and show some support, and I’m very blessed man, and I’m going to try and be the champion you guys want me to be. Thank you.